My friends and I had dinner here two weeks ago. I used to walk past this restaurant when I had to take the TTC to school when I lived in the neighborhood. Ichiban Sushi House is located on the ground floor of Empress Walk and has been there for over a decade. The decor is abit rustic while the lighting is dim. 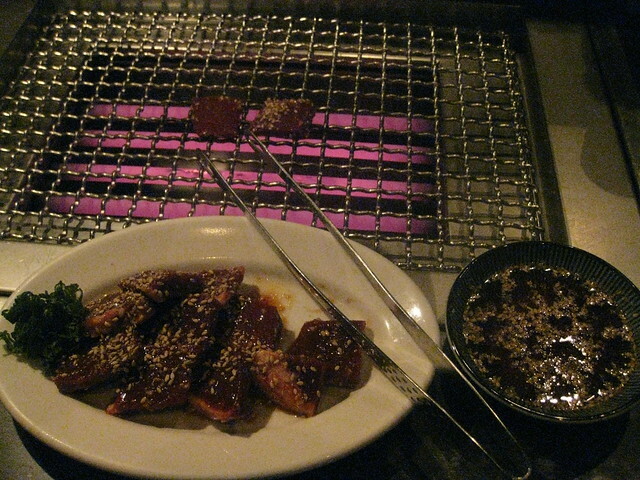 A friend got the LA Kalbi ($16.95 + tax & tip) which is Korean style grilled beef short ribs. It comes with miso soup, salad, rice and ice cream for the dinner set. 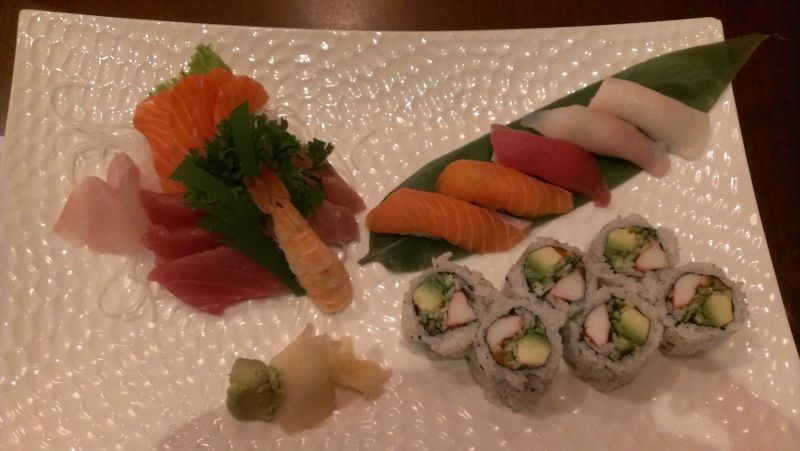 Another friend got the Sashimi & Sushi dinner set ($18.95 + tax & tip). 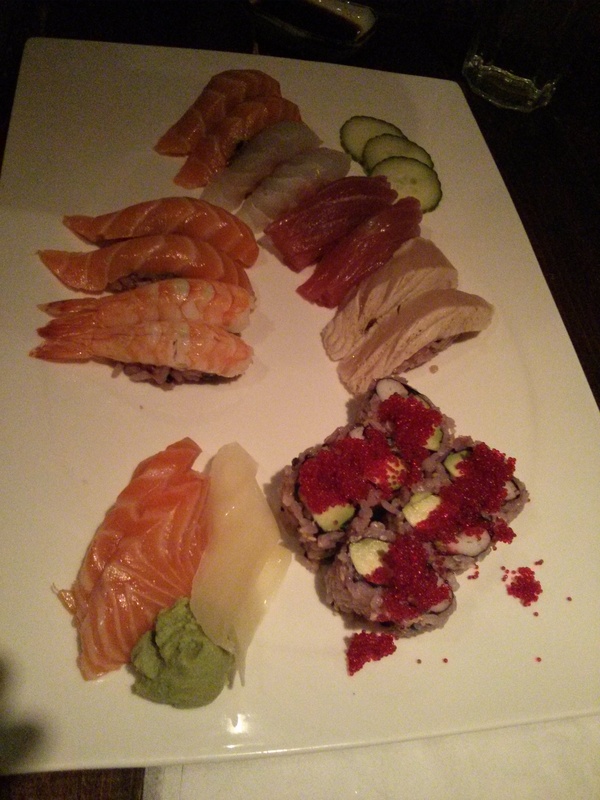 It consists of a variety of sashimi and sushi along with a California roll. 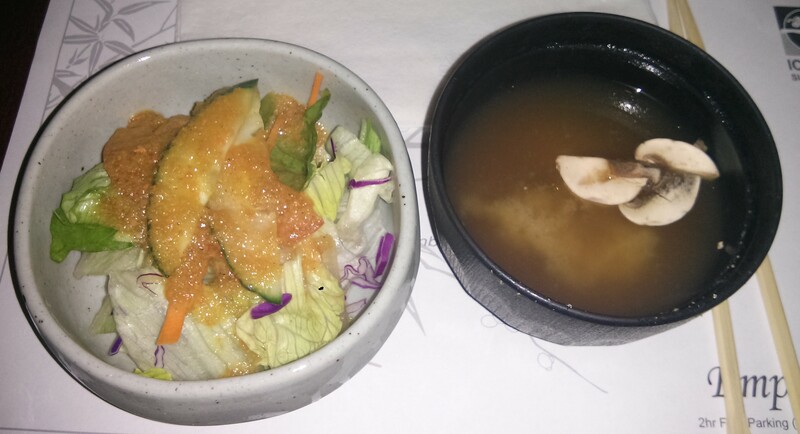 It comes with miso soup, green salad and ice cream. Both of my friends weren’t amazed by their dishes; they thought it was normal, nothing spectacular. My friend also thought the sashimi wasn’t that fresh. I got the grilled white tuna steak ($20.33 + tip). 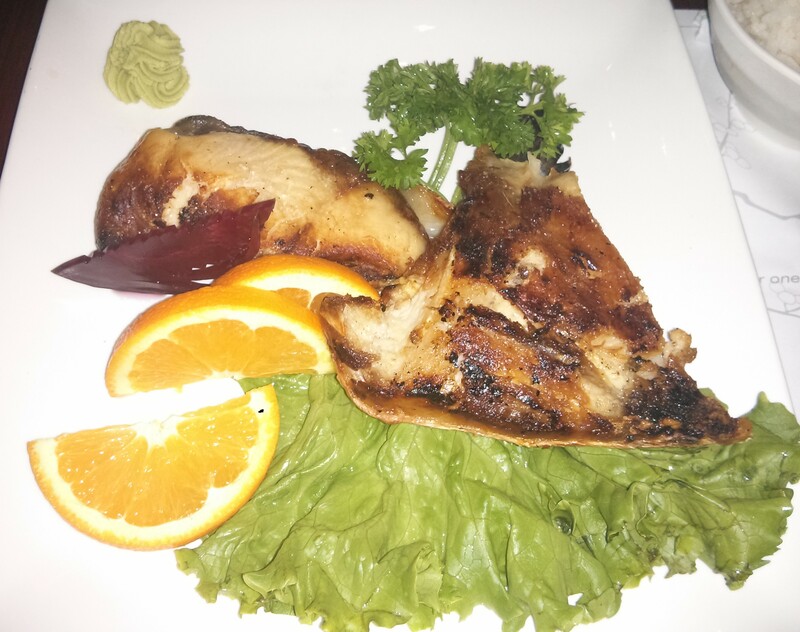 It’s a white tuna steak marinated in a sweet soy sauce that is garnished with orange wedges and wasabi. It comes with miso soup, salad, rice and ice cream. The orange wedges function similar to lemon wedges when squeezed liberally over the tuna steak and it gives it a nice citrusy flavour. The steak is also fine to be eaten on its own without squeezing orange juice on it or putting wasabi on it. The wasabi I found would overpower the tuna steak’s taste even if it’s just a tiny dab of it on the tuna steak. Overall, the tuna steak was quite good. 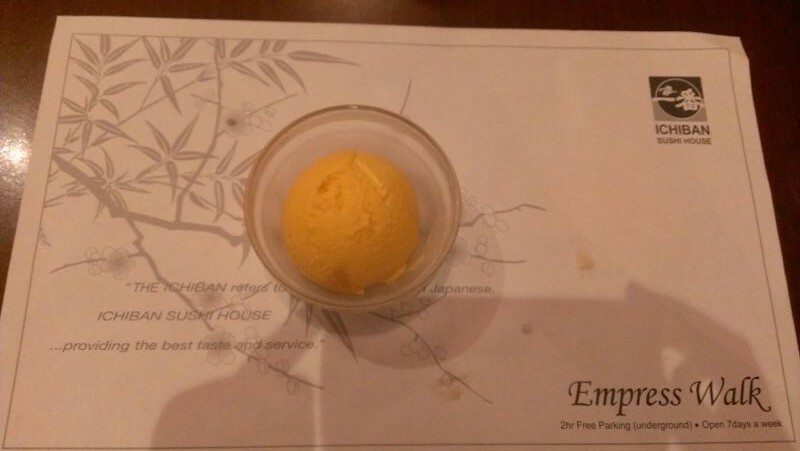 The ice cream is normally green tea however they ran out so we got mango ice cream instead. For an a la carte Japanese restaurant, it’s on the pricier side while the service isn’t very fast. 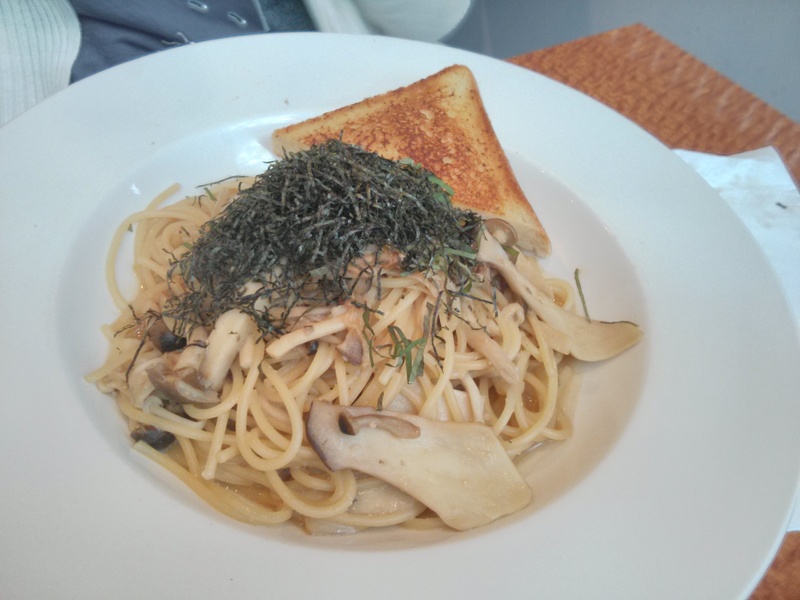 My friends and I decided to eat at Shiso Tree for lunch last month. 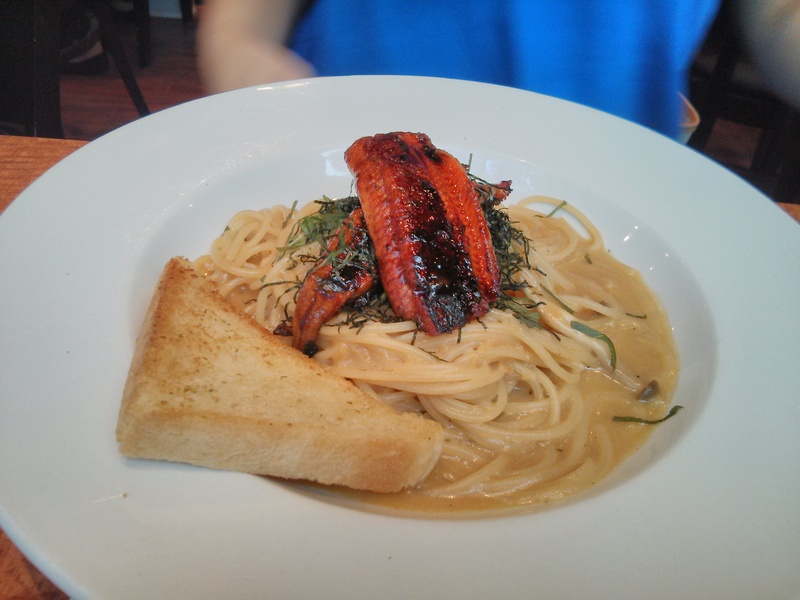 Shiso Tree is in J-town and it’s a fusion Japanese Italian eatery. Tip is automatically allocated on the bill for large groups and large groups can’t do split bills. You also have to order from a special large group menu which excludes a number of pasta options that are available to smaller groups. The pasta is served with salad and garlic bread. The garlic bread comes with the pasta dish. 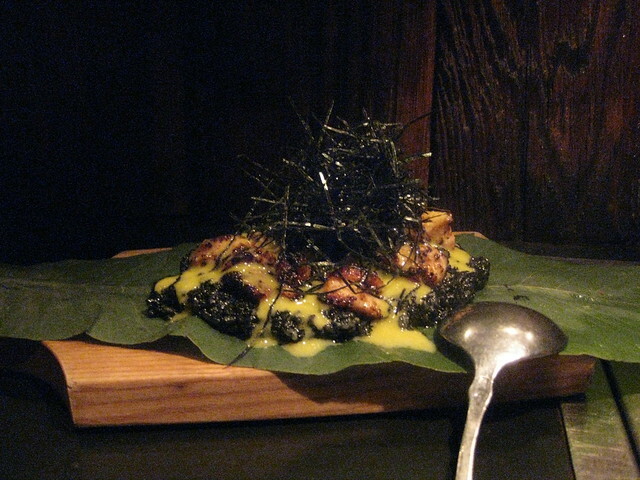 One friend got the Shrimp Cream of Corn ($12) which consists of cream of corn, sake, shrimp, nori and shiso. Most of my friends decided to get the Shrimp Okonomiyaki pasta ($14) which consists of bacon, onions, Japanese mayo, bonito flakes, steak sauce, garlic dressed shrimp over spaghetti noodles. It’s considered a wafu pasta. They enjoyed it. Another friend got the Unagi-Don ($17) which consists of Japanese barbecued eel, shimeji mushrooms, cream teriyaki sauce, nori aka seaweed and shiso (minty herb). She liked it. Another friend got the Shoyu Mushroom pasta ($11) which consists of enoki mushroom, king oyster mushroom, shimeji mushroom, Japanese soya sauce aka shoyu, nori and shiso. It’s also considered a wafu pasta. She enjoyed it. 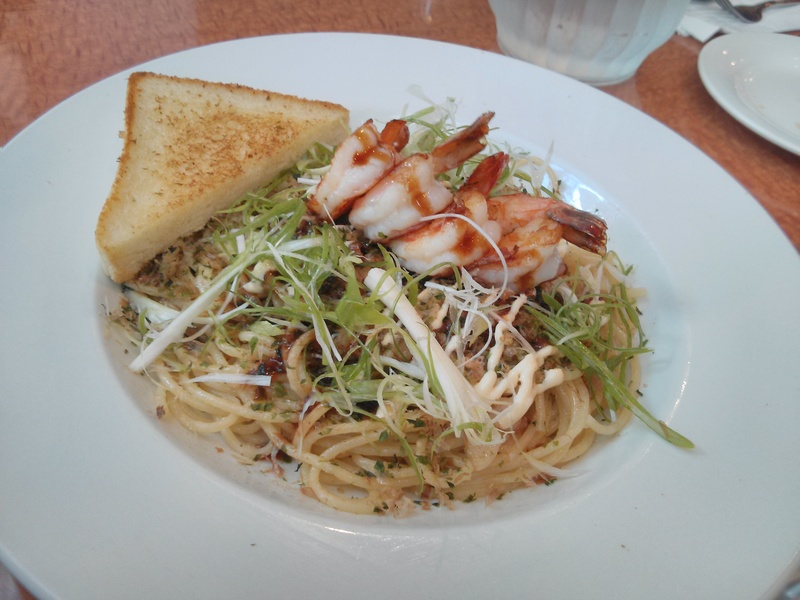 I got the special which is the Wafu Seafood Spaghetti ($18). 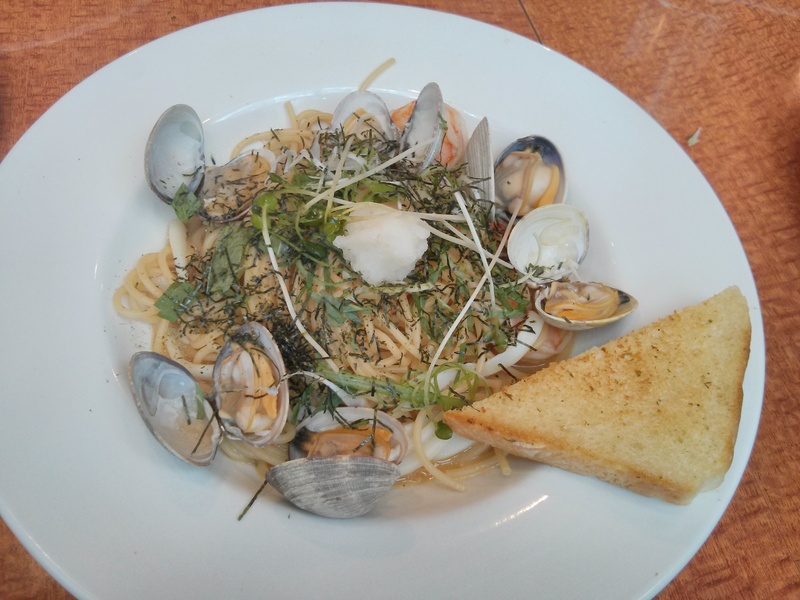 It consists of clams, shrimp and squid in shoyu & dashi sauce on top of spaghetti noodles and garnished with green onions, yuzu, nori and shiso. It was delicious and very filling. 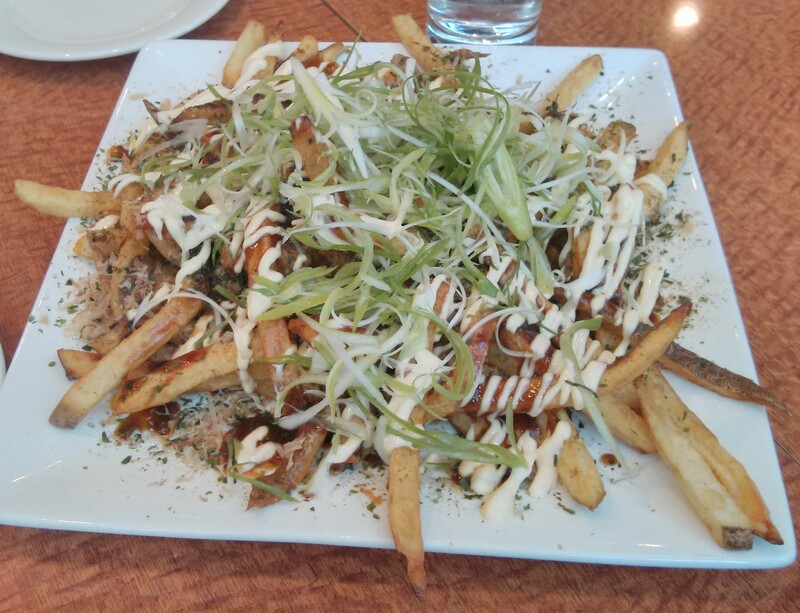 I also decided to split the Okonomiyaki fries ($8) with 2 other friends. 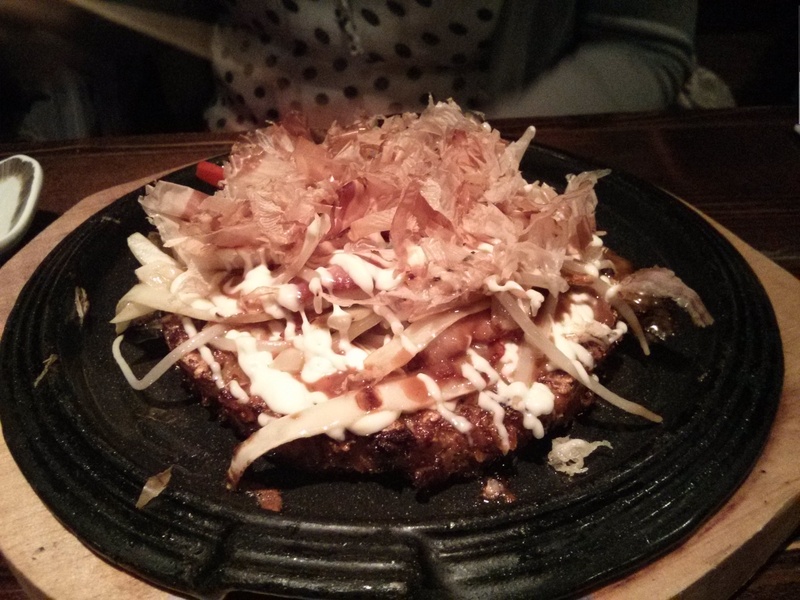 The Okonomiyaki fries is fries topped with Japanese mayo, bonito flakes, green onions and steak sauce. It’s quite delicious and it can easily be a meal on its own. I recommend this restaurant if you’re looking to try Japanese-Italian pasta and Japanese inspired poutine. 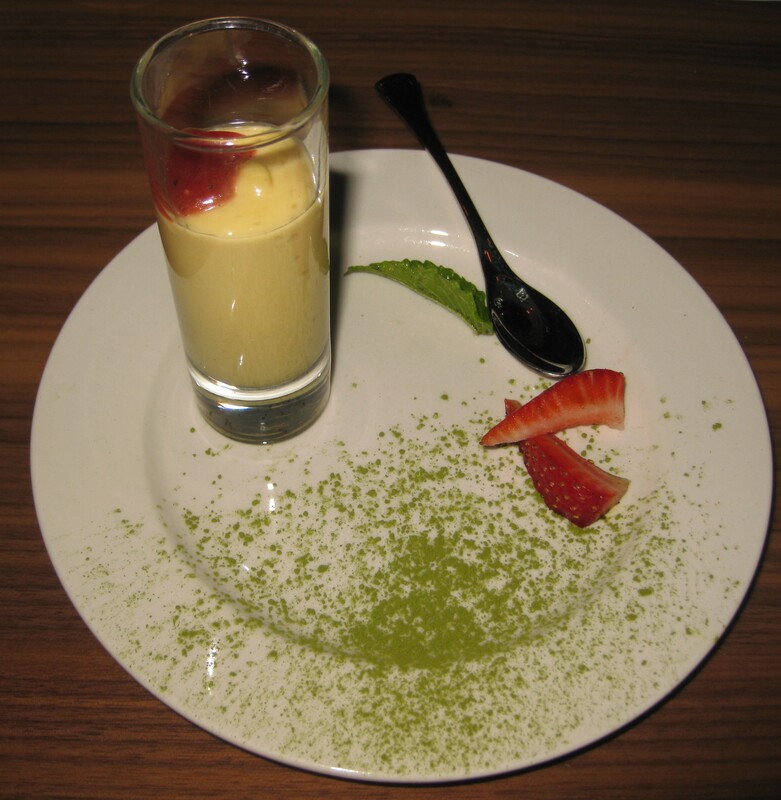 The next time I come, I want to try their desserts, especially the black sesame creme brulee. 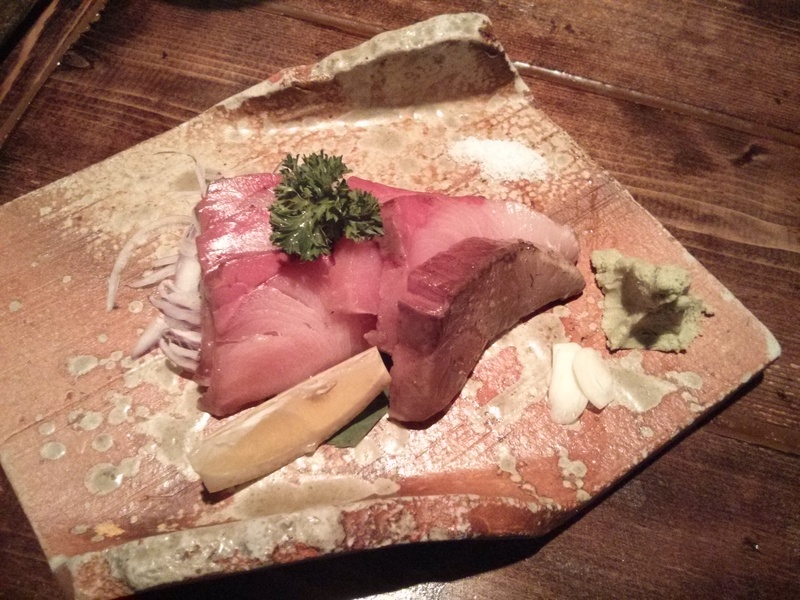 Last night my friends and I ate dinner at Shibui Robata Bar. Shibui Robata Bar is owned by the same owners as Copacabana and they share the same hostess station. Shibui is located on the ground/basement floor while Copacabana is located on the upper floor. The lighting at Shibui is romantic while the decor reminds me of the ocean and being at a trendy beach-side bar. The washrooms have an interesting mural of beach pictures. The overall theme of the place is ocean. We sat at a booth table in the back corner. If you’re able to get a seat by the bar, you would be able to watch the chefs cook. 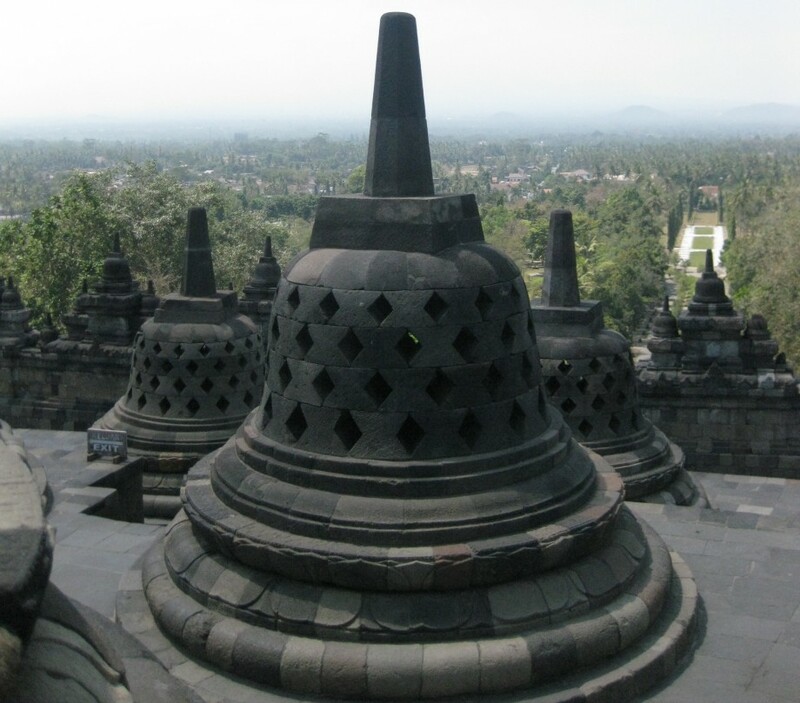 The service was friendly and attentive. Summerlicious dinner is $25+tax & tip. Being a party of 7, tip was already added onto our bill so we paid $34.06. A word of warning, each bottle of water is $1. On the Summerlicious website, the summerlicious menu says that there is prime rib eye, asparagus and Eel Oshi Zushi roll however at the restaurant, the menu doesn’t state prime rib eye or eel oshi zushi roll (you can’t get it when ordering from a Summerlicious menu) and they ran out of asparagus at 7:30pm. A friend had the Kinoko Salad for the appetizer, Shibui Salmon Maki, pork belly and corn for the mains and mango gelato for dessert. 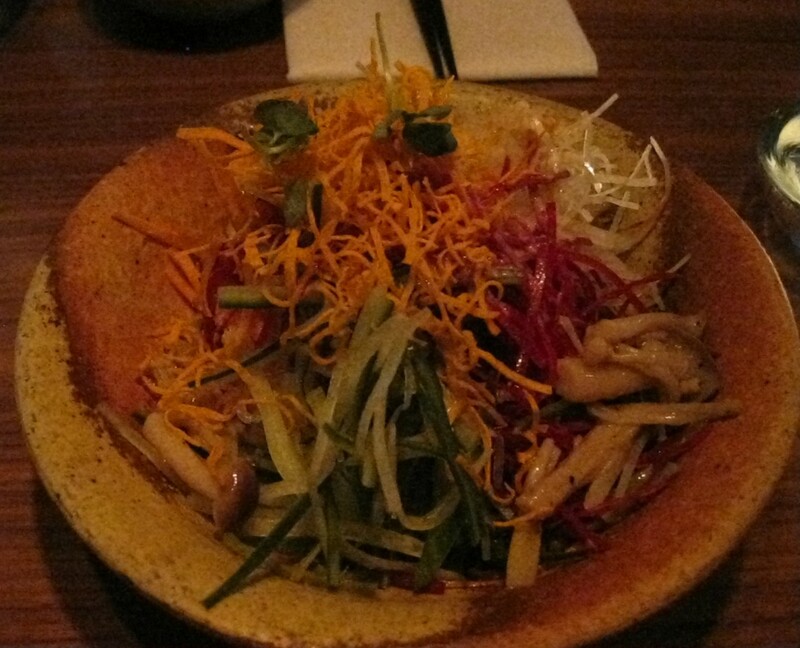 The Konoko Salad is Soba noodles, enoki mushroom, ponzu dressing, daikon, carrots and cucumber. 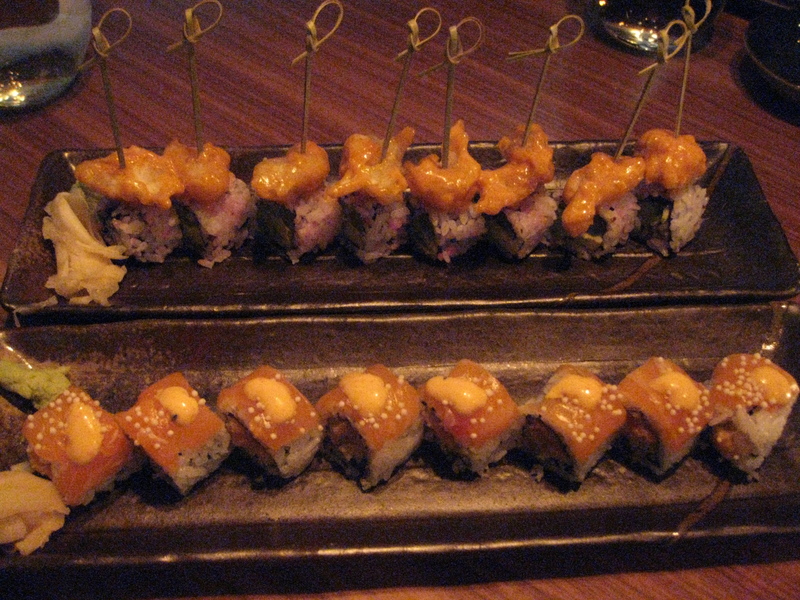 Shibui Salmon Maki is a sushi roll comprised of spicy salmon and tempura flakes with salmon on top. It’s quite good from the piece that I had. The pork belly is marinated with shichimi pepper. I thought it was quite delicious from the piece I had while my friend wasn’t satisfied with the meat to fat ratio. She didn’t think it was as good as I did since there was more meat than fat. 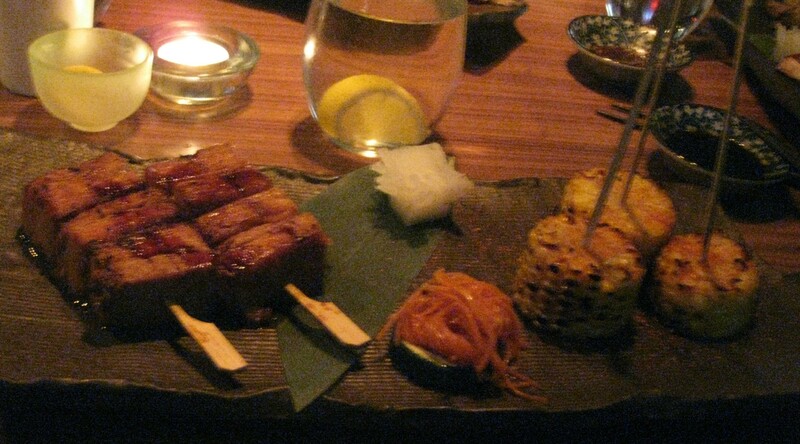 The corn is marinated with yuzu butter sauce and it was quite good from the piece I had. Another friend had the Chilean Sea Bass Dumplings for the appetizer, sashimi, lamb chop and sweet potato for the entrees and Passion Fruit Mousse for dessert. He thought the dumplings had a really fishy smell to it. 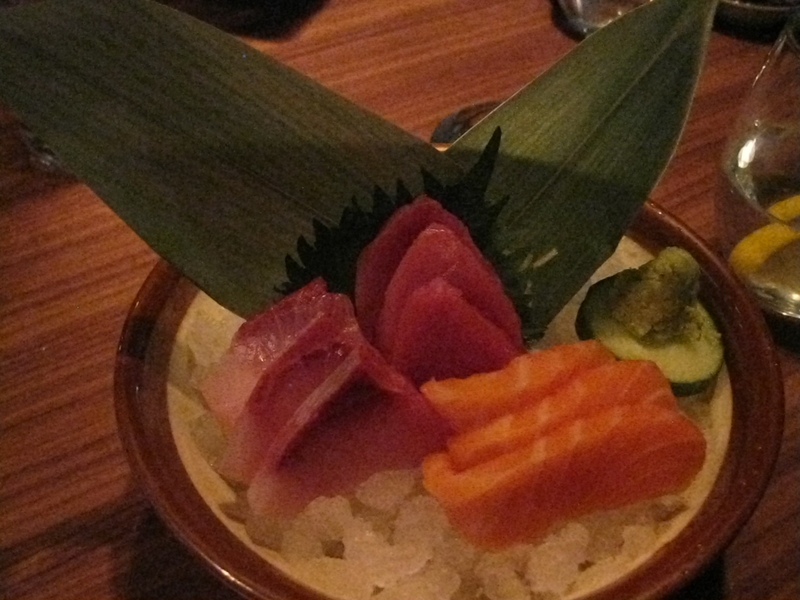 The sashimi is a trio of salmon, tuna and snapper sashimi. My friend liked how fresh the sashimi is. The lamb chop is marinated with a spicy Korean miso glaze while the sweet potato is marinated with red miso sauce. A third friend had the Crispy Rice with Salmon for the appetizer, Pirikara Ebi Maki, filet mignon and sweet potato for the mains and mango gelato for dessert. The crispy rice with salmon is pan-seared sushi rice topped with salmon and garnished with a slice of green pepper. My friend thought it was delicious. 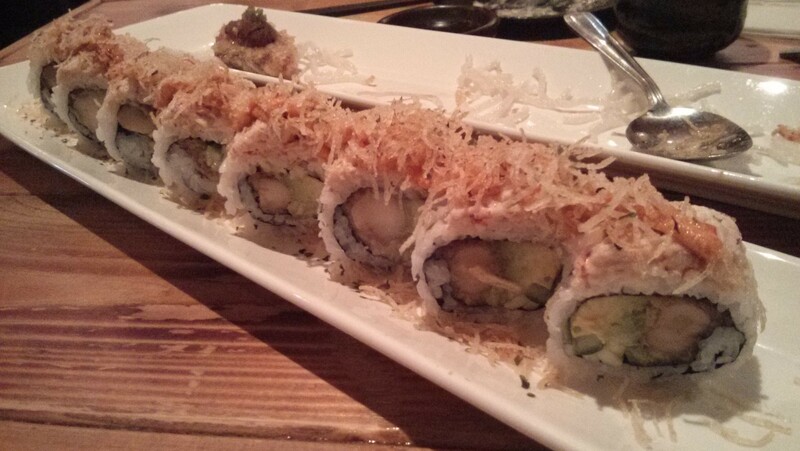 The Pirikara Ebi Maki is a sushi roll comprised of avacado, cucumber, chili mayo sauce and crispy fried shrimp on top. The filet mignon is marinated with Shichimi soy sauce. A fourth friend had the Kinoko Salad for the appetizer, Shibui Salmon Maki, pork belly and cremini mushrooms for the entrees and Passion Fruit Mousse for dessert. 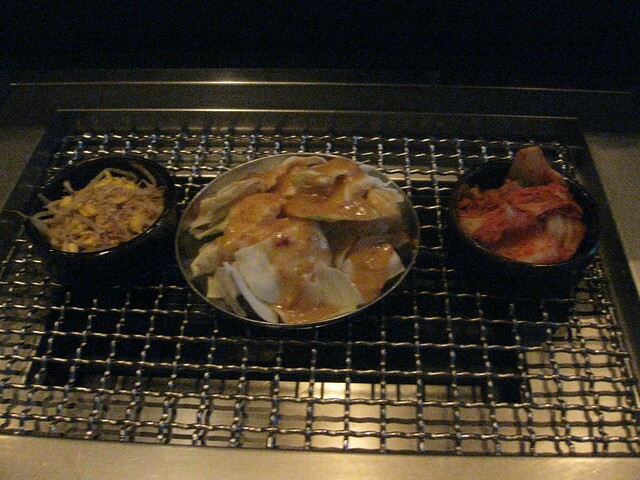 The mushrooms are marinated with teriyaki sauce. A fifth friend had the Kinoko Salad for the appetizer, Sushi Nigiri, filet mignon and mushrooms for the entrees and Passion Fruit Mousse for dessert. 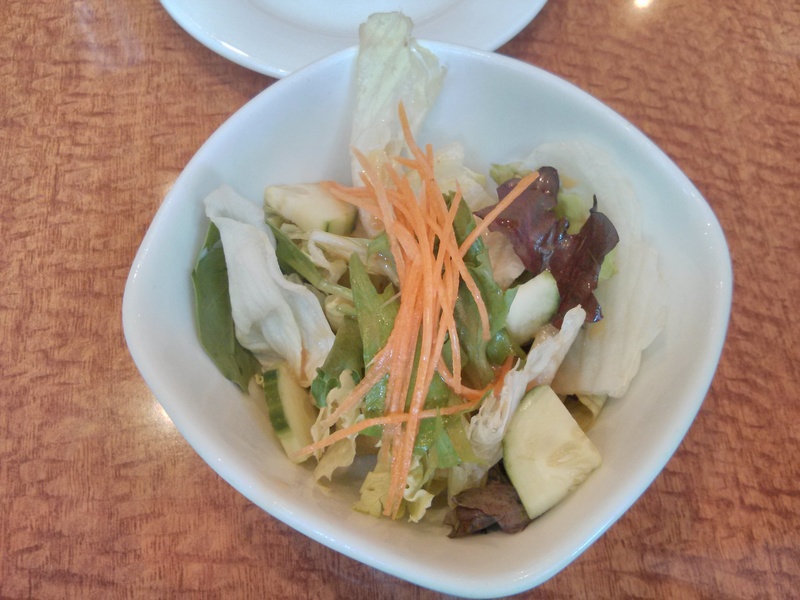 My friend thought the soba was very soft and smooth and the ponzu dressing was zesty for the Konoko Salad. Sushi Nigiri is a trio of salmon, tuna and snapper sushi. A sixth friend had the Chilean Sea Bass Dumplings for the appetizer, Shibui Salmon Maki, scallop and sweet potato for the mains and Passion Fruit Mousse for dessert. I had the Chilean Sea Bass Dumplings for the appetizer, Pirikara Ebi Maki, filet mignon and sweet potato for the mains and Passion Fruit Mousse for dessert. The rabota dishes all came with a daikon/radish in a fancy shape and cucumber topped with carrots. It was quite tasty. Although the a la carte prices are on the pricey side. I may come back again to try other things on the menu. 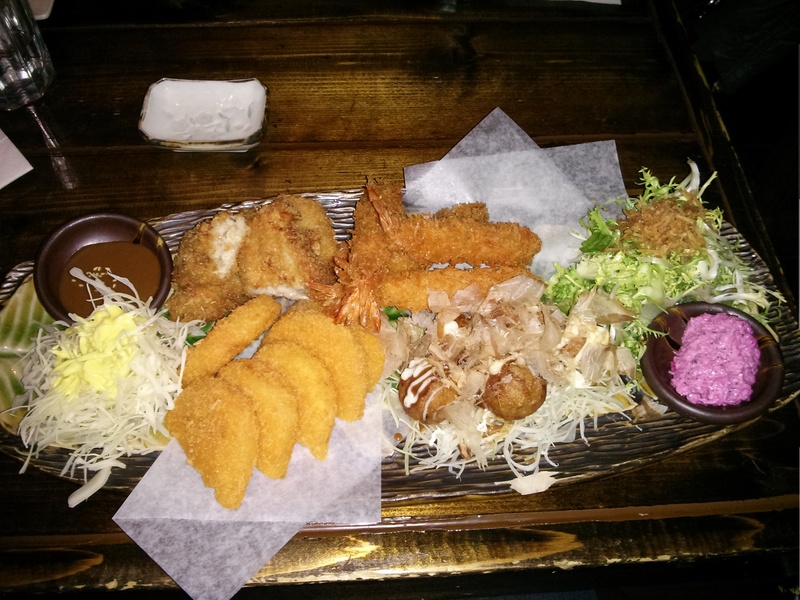 My friends and I went to eat dinner at Nome Izakaya on a Thursday night. Nome Izakaya is quite small although they have a fairly large waiting area. We were able to get a table by the oyster bar between the two flat screen tvs. Thursdays are their $5 cocktail specials and 1/2 price sangrias. I got The Geisha ($5) while another friend got the Mango Mojito. We ordered the Double Salmon Roll ($14), deep fried pork belly ($6.50), Mack-Attack ($9.80), Apple Salmon ($7.50), Maguro & Avacado Tartare ($9.70), baked oysters ($9.30), takoyaki ($5.50), Japanese chicken poppers ($6.30), buttered scallop & shrimp ($8.80), Lobster Fantasy Roll ($18), Unagi Tempura ($12) and Sesame Salmon ($7.50). We also had green tea which costs $1.52. The Geisha regularly priced is $7 and is made of a plum wine mimosa with grapefruit pulp and flower petals. I wasn’t able to taste the flower petals however on the whole the drink is quite good. 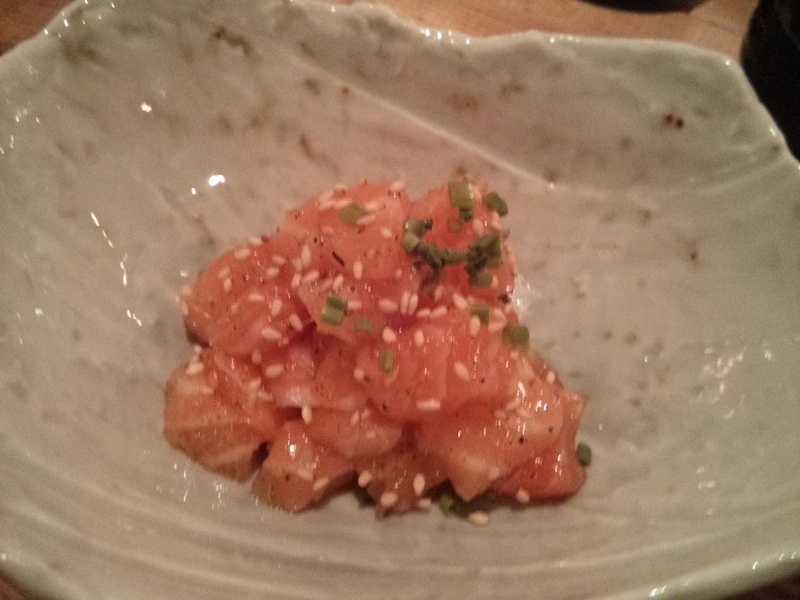 It wasn’t sweet at all and the sourness of the grapefruit is balanced out by the sweetness of the plum wine. The deep fried pork belly is deep fried marinated pork belly with seaweed paste and topped with onions. One of my friends and I enjoyed it. 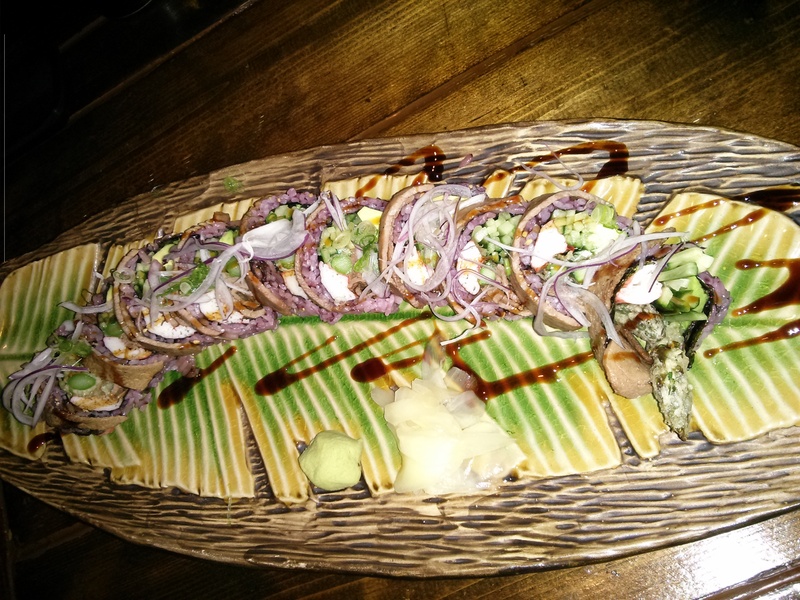 The Double Salmon roll is marinated grilled salmon, cucumber, lemon steamed asparagus and avacado in a roll that is topped with smoked salmon and horseradish mayo. My friends and I enjoyed it. 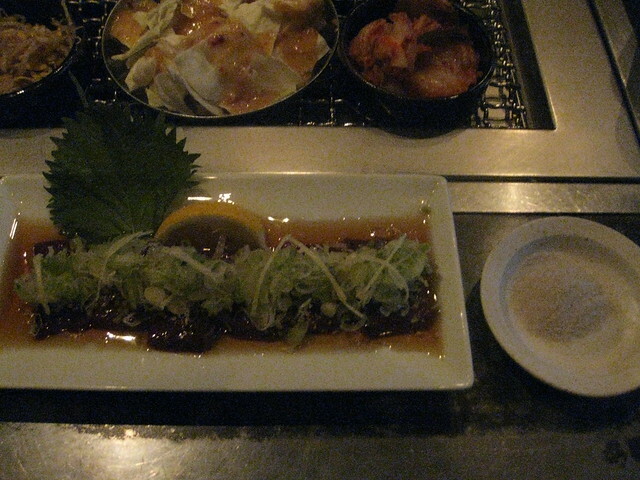 The Mack-Attack or Aburi Shime Saba is lightly seared mackerel with ground ginger, green onions and a lemon wedge. I thought it was quite delicious. My friend said that the mackerel by itself is salty however I always garnished it with ginger, green onions and freshly squeezed lemon juice which perfectly compliments the mackerel. 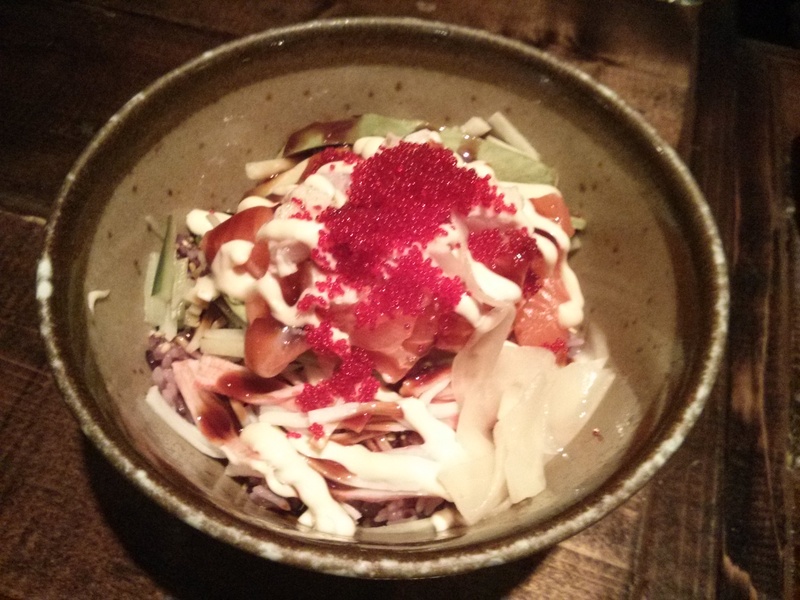 The Apple Salmon is salmon sashimi topped with apple mayo dressing. It was interesting. My friend said that she could taste the apple while I thought that the apple was more in the smell than the taste. 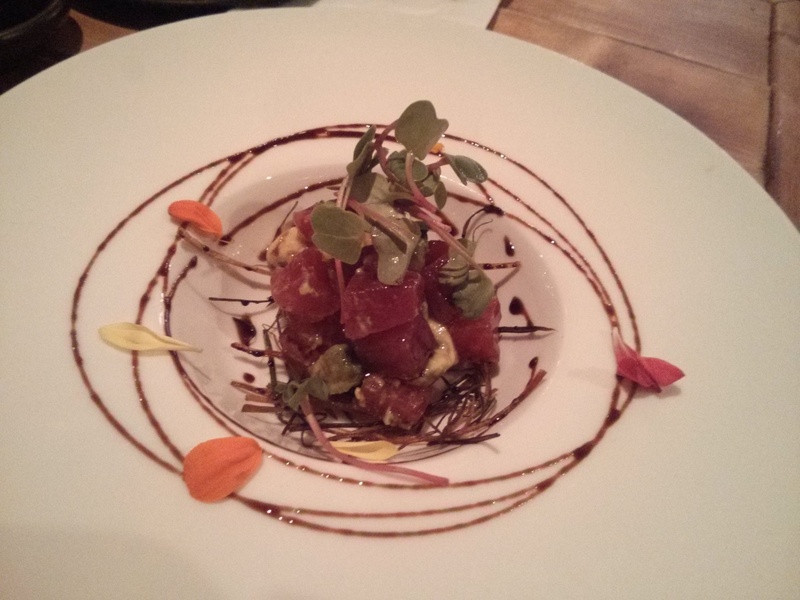 The Maguro & Avacado Tartare is diced tuna sashimi and avacado, garlic oil, sea salt and balsamic reduction sauce. 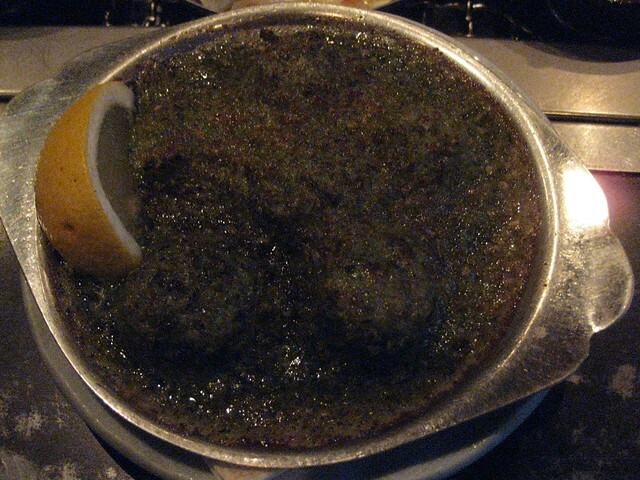 The baked oysters or kakimayo are 4 pieces of oven baked oysters topped with spinach cream sauce. It is scrumptious. Takoyaki is deep fried octopus ball with tokatsu sauce, mayo, green onions and bonito flakes. The Japanese chicken poppers or kara-age are Japanese style fried chicken with wasabi mayo. I prefer the karaage at Cafe Michi however the wasabi mayo is quite good. 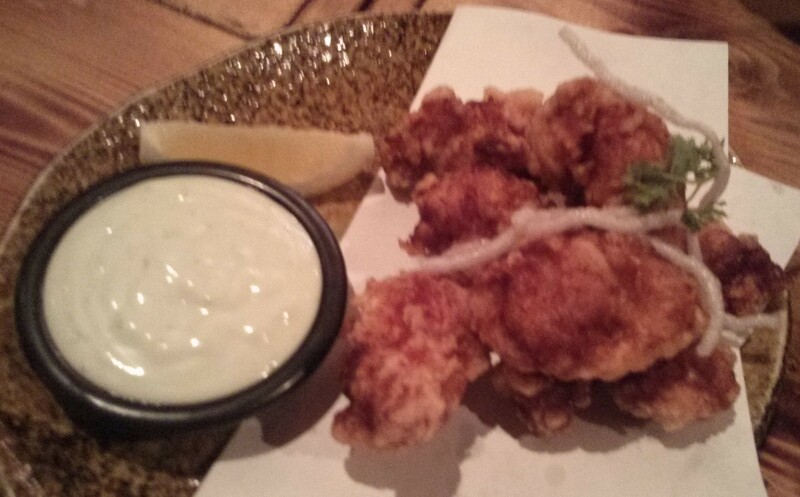 I liked the karaage with ample wasabi mayo and some freshly squeezed lemon juice on it. Buttered scallop & shrimp is baked scallop and shrimp in garlic butter. It is scrumptious. The Lobster Fantasy Roll is deep fried lobster tail, cucumber and avacado in a roll that is topped with lobster salad and grilled red pepper sauce. It was absolutely delicious. Unagi tempura is unagi tempura topped with green onions and My friend had commented that the topping reminded her of how a Japanese salad tastes like. The Unagi tempura is also good with a bit of wasabi mayo. Sesame Salmon or Salmon Goma Abura Ae is diced salmon sashimi mixed with garlic, chives, sea salt and sesame oil. It’s quite good. A University friend and I came here for lunch at the end of May. We got reservations since Yelp strongly advised us on getting reservations otherwise the restaurant would turn you away. The restaurant is fairly small however my friend and I got a table in the back by the sushi bar. My friend has been here before while this was my first time. 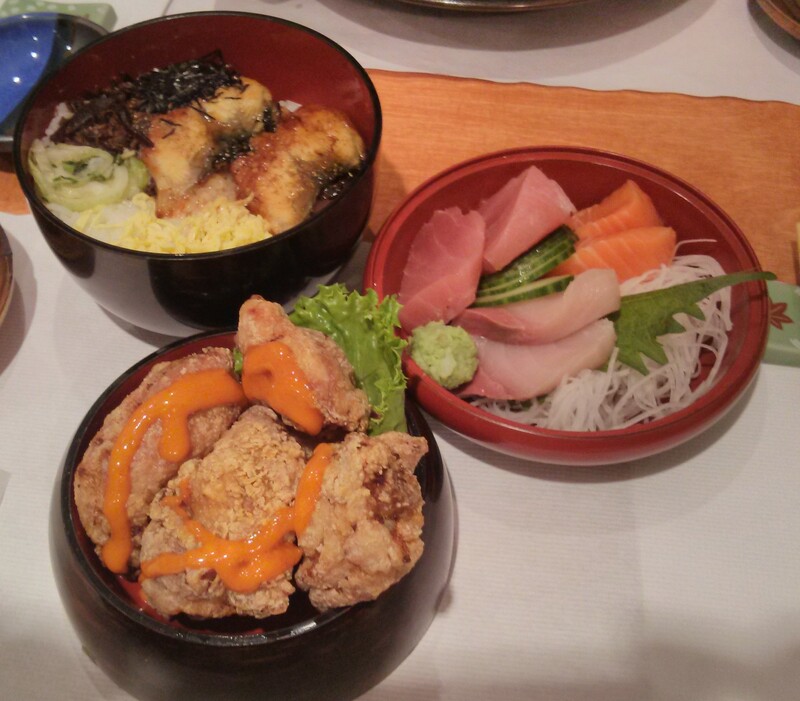 I decided to get the Chyo-chin bento ($24.95) while my friend got the Unatama lunch special ($21.95). The Unatama lunch special includes a choice of green tea or coffee, your choice of a slice of cake, a garden salad, miso soup, and barbecued eel with green onions in simmered egg on rice. 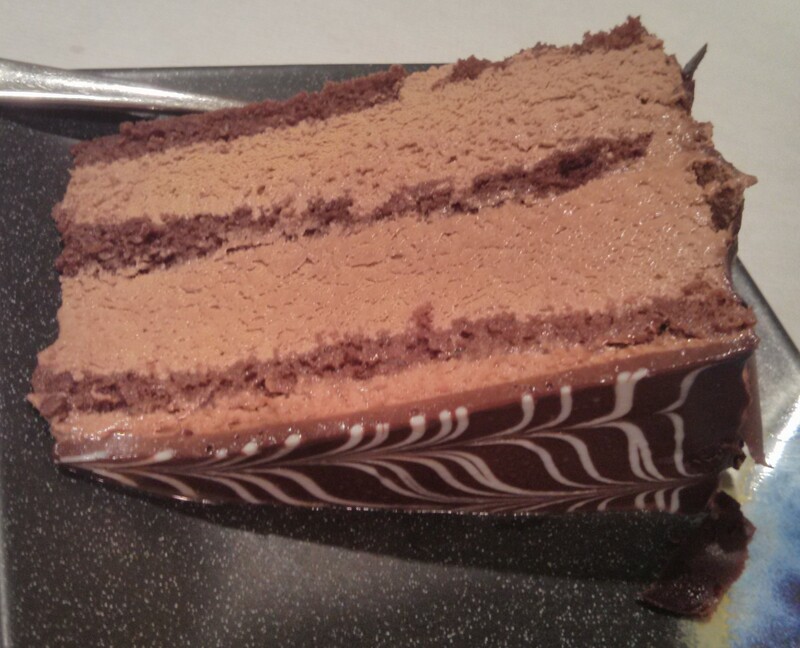 My friend chose green tea and chocolate sake mousse cake. My friend enjoyed her meal. The chocolate sake mousse cake was quite delicious from the small bite I had. The Chyo-chin Bento includes a choice of green tea or coffee, your choice of a slice of cake, a garden salad, Karaage, sashimi and unajyu on sushi rice. I chose green tea and the green tea cake. 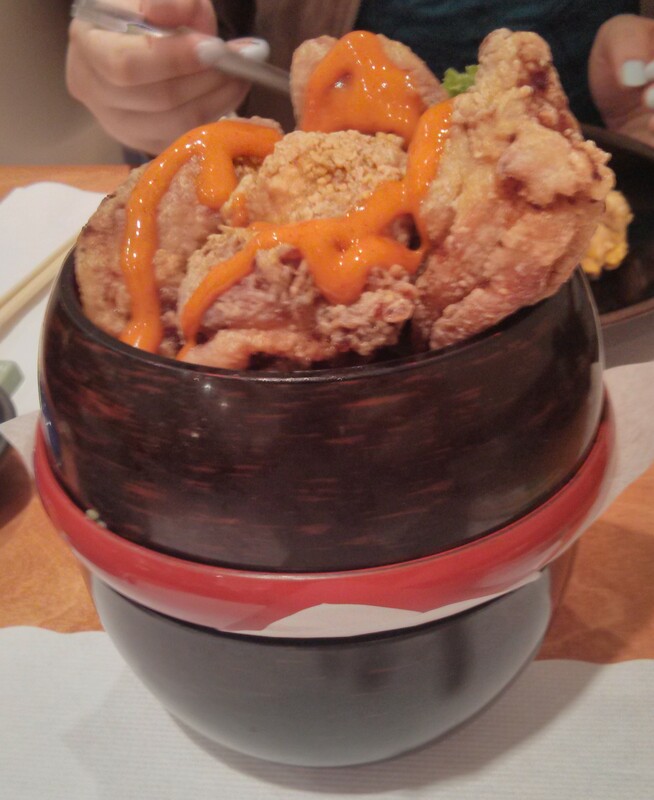 Karaage is deep fried chicken. It was quite delicious. It wasn’t too oily although the sauce is slightly sweet. They deep fried it perfectly in that it had a bit of a crunch to it without being too hard. Unajyu is eel and the dish also came with seaweed, egg and lettuce. The dish was scrumptious and all the ingredients perfectly compliment each other. The eel was quite soft and tasty. 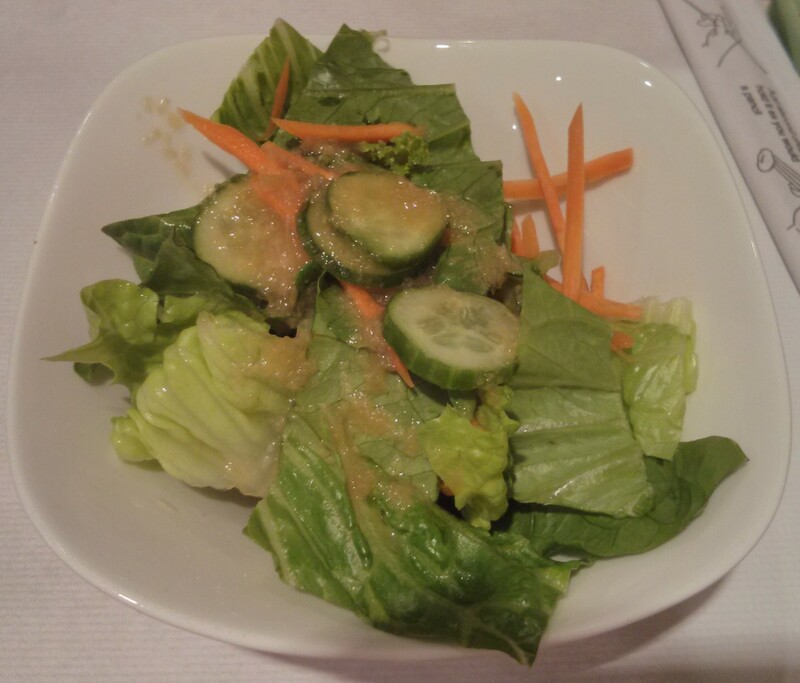 The salad and sashimi were alright. 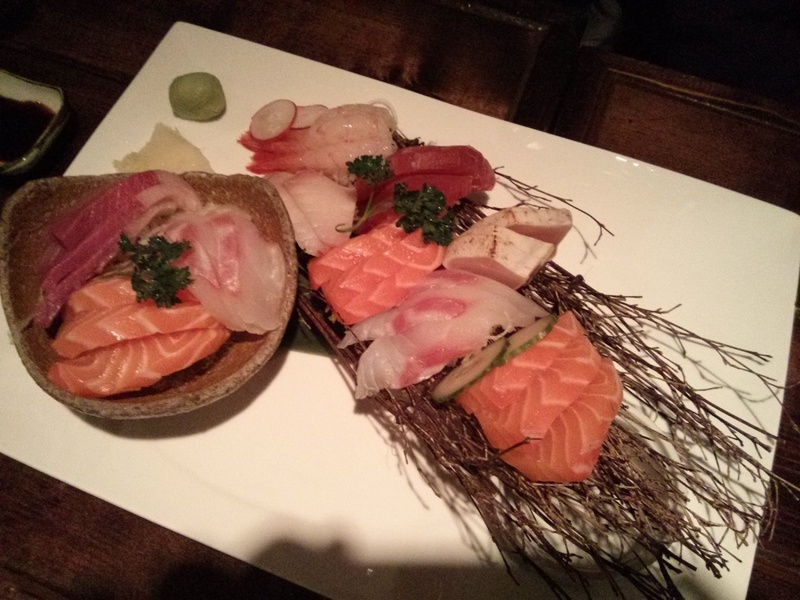 The sashimi were thick slices which is really nice and very fresh. There isn’t much variety for the sashimi however. 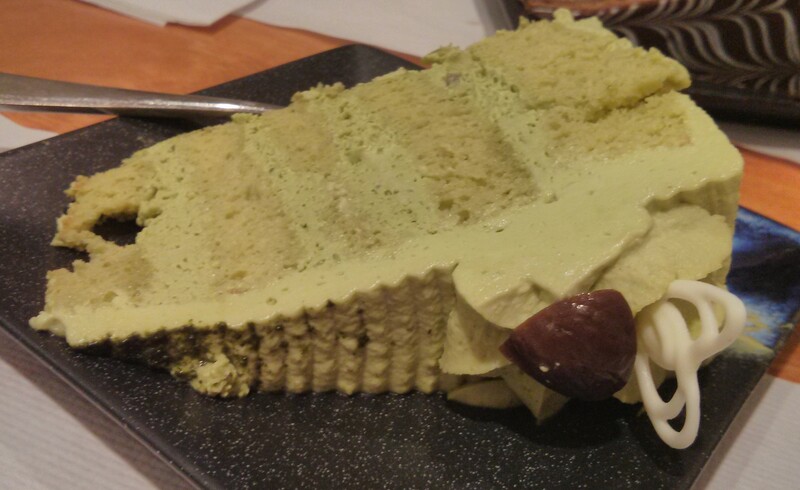 The green tea cake was delicious. It wasn’t sweet and I could taste the matcha. The particular slice I had was abit skimpy on the red bean paste however I liked it since the focus was on the green tea rather than the red bean. The service was quite friendly and prompt. My only disappointment is that there wasn’t a teapot at the table, instead I had to ask the servers multiple times for green tea refills. Tea refills aside, Cafe Michi can be slightly pricey since cake slices are between $5-7 and sashimi/sushi sets are between $20-40. Although the place is slightly pricey compared to other Japanese restaurants that are strictly a la carte, I would definitely come back to try their chirashi sushi, tofu cheesecake, green tea creme brulee and other dessert and cake offerings. My friends and I went back to eat at Izakaya Tsuki because my friend was craving Japanese food. She ordered the buttered squid ($8) again and tried the Tsuki Don ($13) and Three Mori Sashimi Moriawase ($10). The other friend had takoyaki ($7), okonomiyaki ($9) and green tea ice cream ($3). 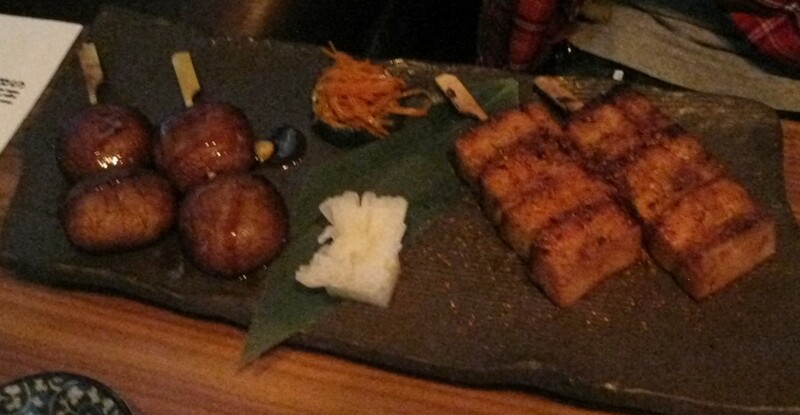 I had the Hamachi Wara Yaki ($11), Akabeko “Red Cow” Roll ($12.50) and Taro Ice Cream ($3). Buttered Squid is squid grilled with butter and soy sauce. It’s just as delicious as before. Tsuki Don is California Don topped with assorted diced sashimi. California Don ($9) is avocado, cucumber, tobiko and crabmeat on rice. It’s basically a deconstructed California Roll. My friend enjoyed it. Three Mori Sashimi Moriawase is 9 pieces of a variety of sashimi. I liked the bowl of smoke that accompanied the dish. Takoyaki is puffed octopus ball served with tonkatsu sauce. She enjoyed it. Okonomi Yaki is a Japanese savoury pancake that’s topped with vegetable and katsuo (katsuobushi). She enjoyed it. 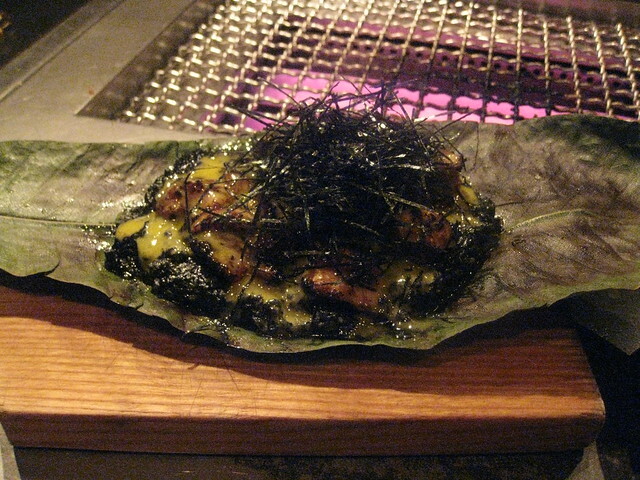 Hamachi wara yaki is yellow tail sashimi that is smoked over burning hay. It’s served with a lemon wedge, raw onions, sea salt and wasabi. It’s absolutely delicious. Akabeko “Red Cow” Roll is avacado, aspharagus tempura, cucumber, and rice wrapped with a seared sirloin top. The only thing I didn’t like about it was that the avacado wasn’t ripe. My friends thought that the pieces were too big so they’d rather it was smaller. My friend and I both enjoyed our ice cream. It’s definitely interesting to eat ice cream with a wooden spoon. I’m more used to using metal or plastic spoons to eat ice cream since I feel like I can taste the flavour more. 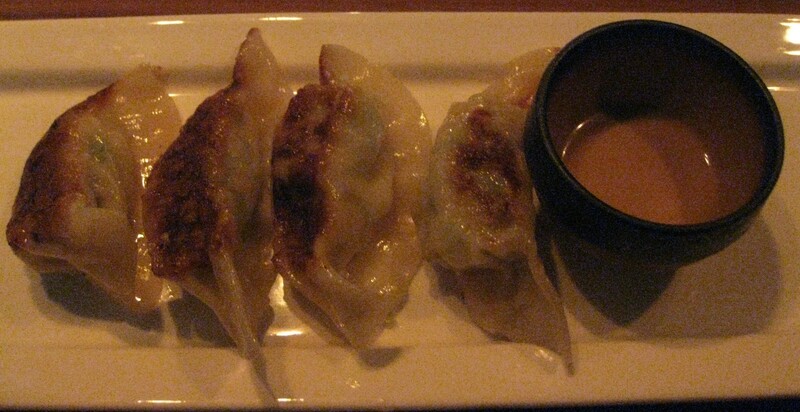 I recommend Izakaya Tsuki cause overall it still serves good food. 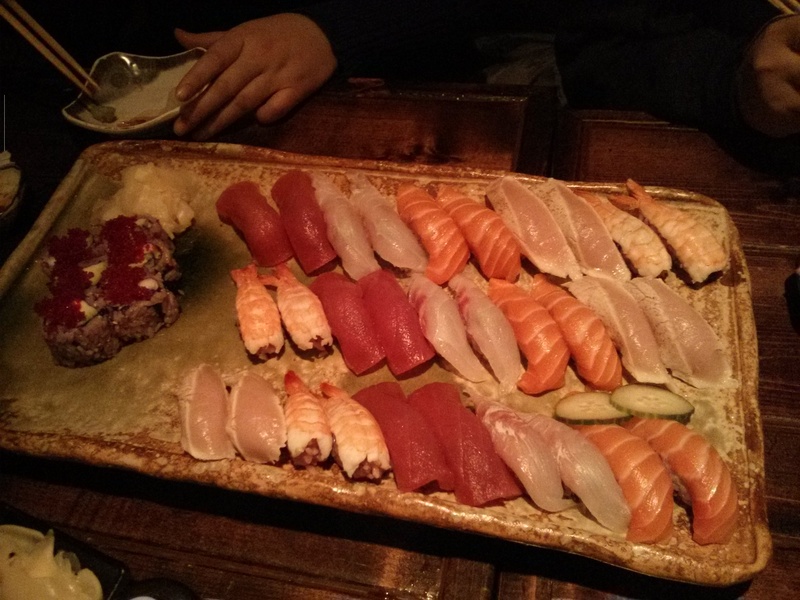 Some of my university friends and I went to eat dinner at Izakaya Tsuki afew weeks ago. Izakaya Tsuki is part of the building that houses Asian Legend, Tea Shop and a furniture store on Yonge Street near North York Civic Center. Izakaya Tsuki looks small from the outside but it’s quite spacious once you’re inside. The tables are mostly separated from each other by partitions which could be nice to have the illusion of privacy. The lighting is on the dim side. My friends arrived before me so when I got there, they already ordered some dishes. 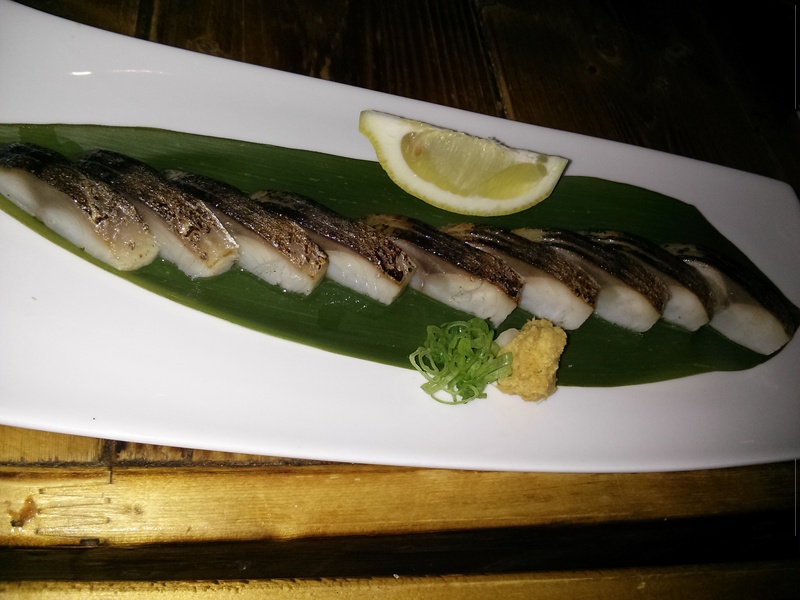 My friends ordered the buttered squid ($8) and Saba no Shio Yaki ($8). 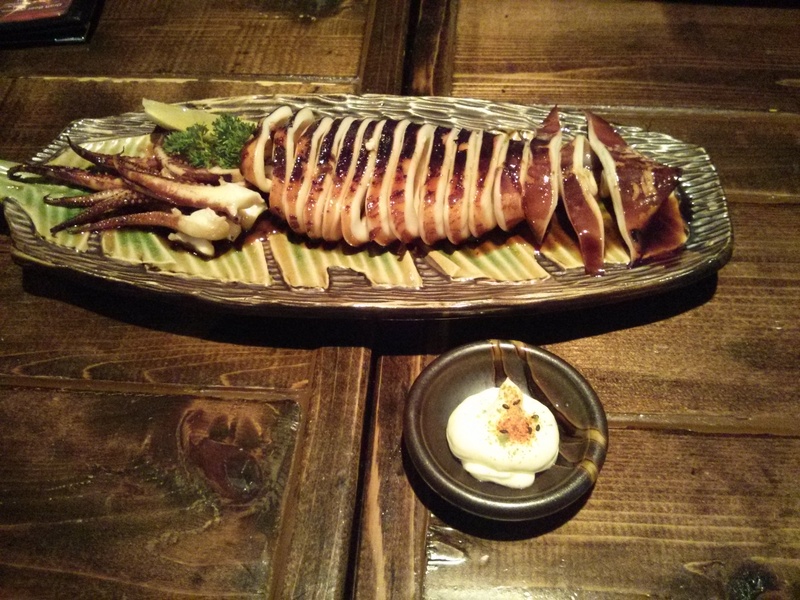 The buttered squid is squid grilled with butter and soy sauce. It’s delicious. My friends loved it. Saba no shio yaki is Mackerel grilled with salt. My friend enjoyed it. One friend and I split the Tako Wasabi ($4). I also got the Summer Night ($19.95) while another friend had the Mikazuki ($23) and two other friends split the Hangetsu ($35). 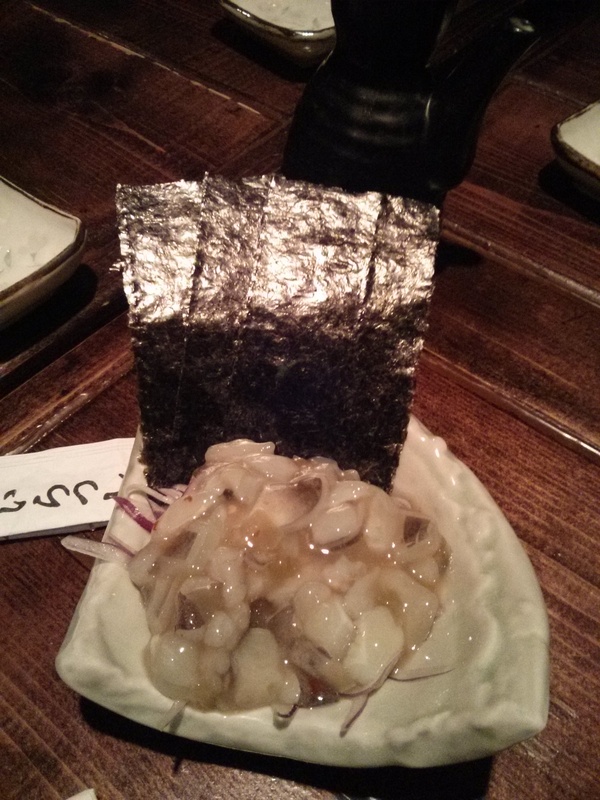 Tako Wasabi is octopus with chopped wasabi stem on a bed of sliced onion. I thought it would be similar to takoyaki but with wasabi inside so imagine my surprise when it came to our table and looked nothing like takoyaki. You have to pick up a piece of seaweed and then put the octopus, onions and sauce on the seaweed, wrap it up like you’re making sushi and eat it in one bite. The wasabi wasn’t overwhelming and overall the dish is interesting. Summer Night has the option of including Kirin or Asahi beer ($29.50). I chose to not include beer since I had to drive. Summer Night is comprised of 5 pieces of takoyaki, 4 pieces of ebi fry, 3 pieces of korokke and kaki fry. 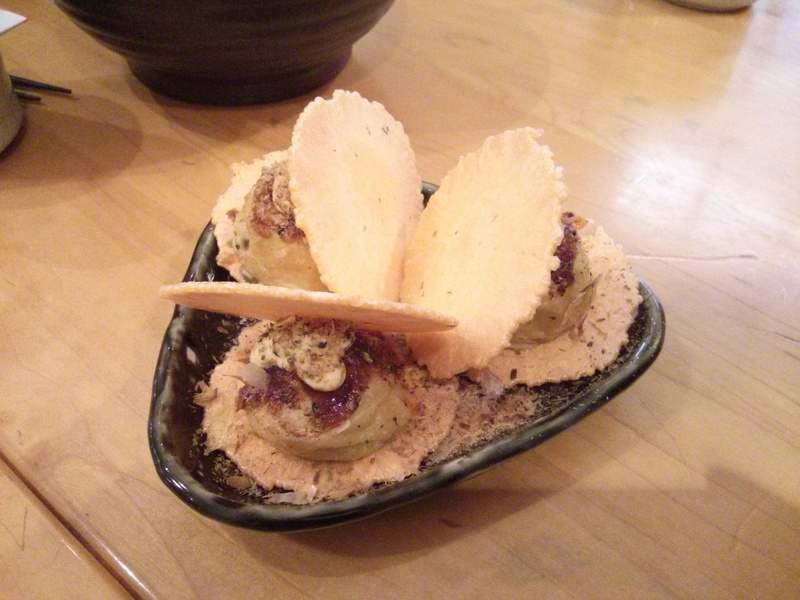 Takoyaki ($7) is puffed octopus ball served with tonkatsu sauce and garnished with bonito flakes. Aside from tempura, takoyaki is one of my favourite deep fried Japanese appetizers/foods. 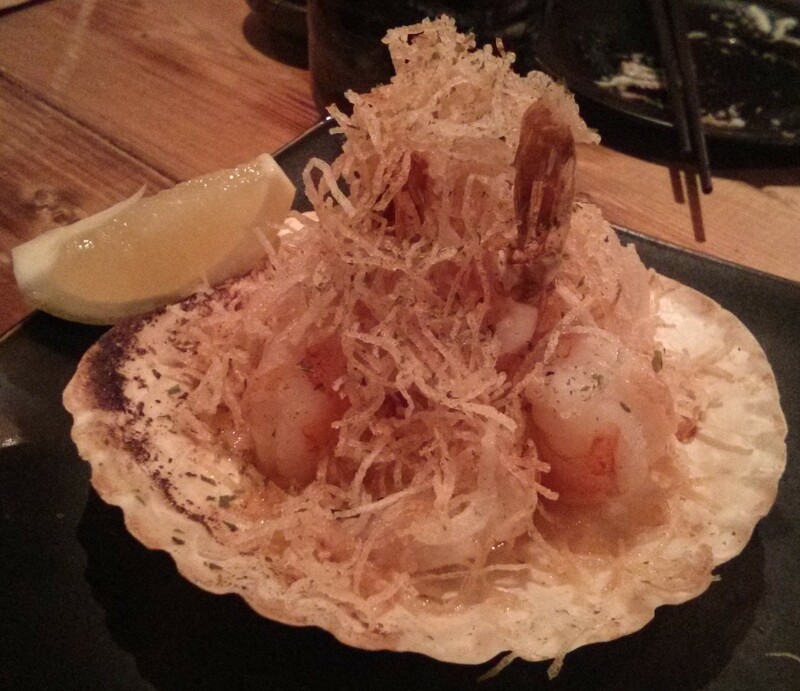 Ebi fry ($8) is deep fried shrimp battered with bread crumbs. It’s delicious and while it reminds me of shrimp tempura, I prefer this version over the shrimp tempera found at other Japanese restaurants. Korokke is deep fried potato cakes coated with panko. Panko is Japanese-style breadcrumbs. Korokke is similar to croquette. Kaki fry ($8) is deep fried oyster served with Japanese tartar and salad. It’s delicious. When I ordered the dish, I thought I’d have some room for dessert however when it came to the table I was slightly surprised at how large it was and how filling it is. Mikazuki is a small sushi and sashimi combo while Hangetsu is a medium sushi and sashimi combo. Mikazuki includes 15pc sashimi, 12pc sushi and maki while Hangetsu comprises of 21pc sashimi, 18pc sushi and maki. 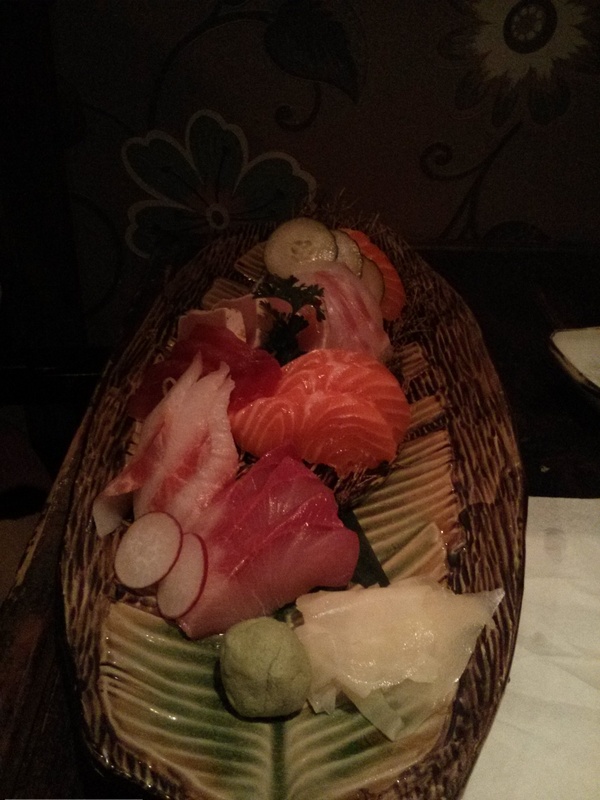 The sushi and sashimi are fresh and my friends enjoyed it. One friend commented that the Hangetsu should have different kinds of sushi that isn’t similar to the sashimi since she was getting tired of eating the same thing. I was too full from my meal so I didn’t order dessert. 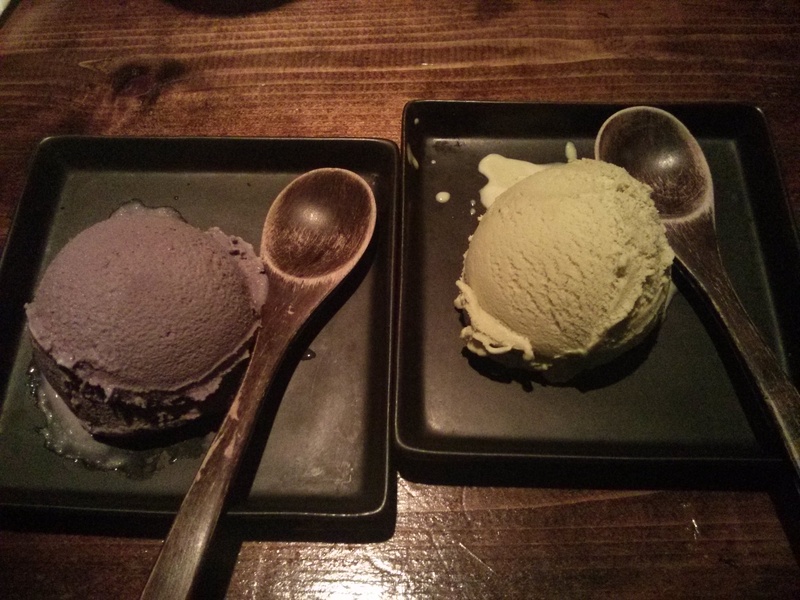 I wanted to try their taro ice cream ($3). There’s always a next time. My high school friends and I had brunch at Manpuku on Mon. May 27. We were planning on wandering around downtown Toronto, specifically Chinatown and Kensington Market so we only ordered 3 dishes. One of my friends had the curry udon ($5.99) while another friend and I split the takosen ($2.99) and tsubugaiyaki ($5.99). Their curry udon was good, my friend gave us some of the udon to try while we let her try the takosen and tsubugaiyaki. My friend usually orders this when she comes here. 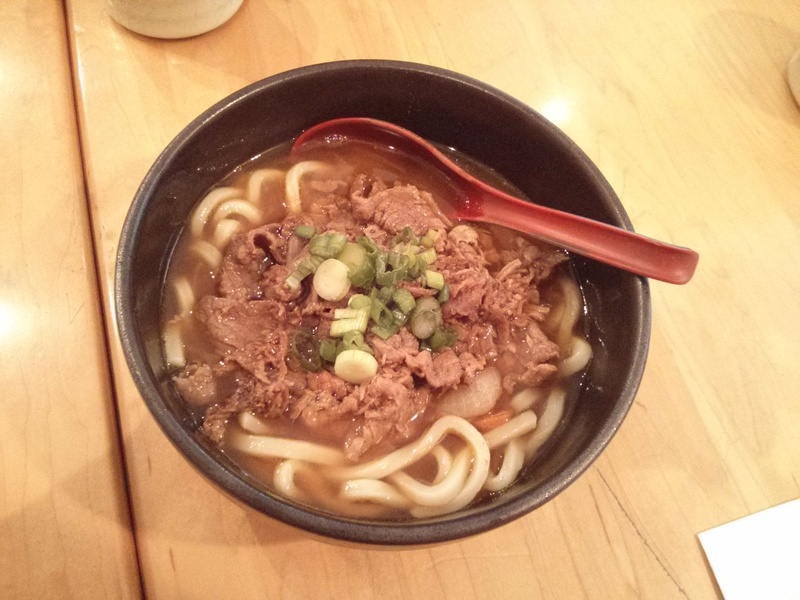 The curry udon comprises of udon noodles, vegetables, beef and Japanese curry sauce. Japanese curry differs from other curries in that it’s sweeter and much less spicier in comparison. 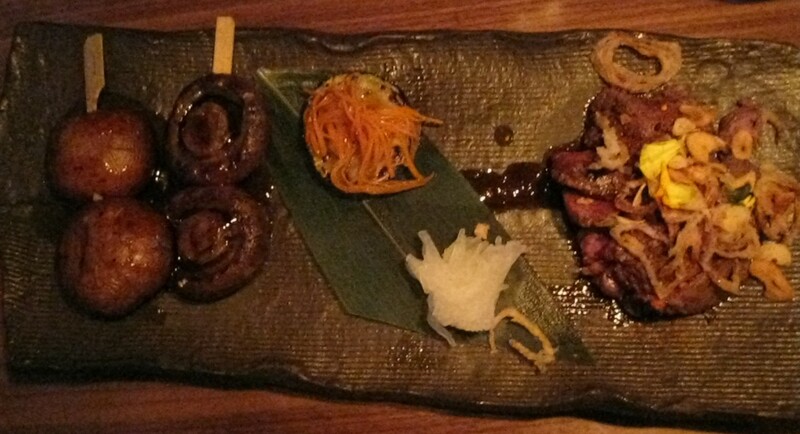 The takosen was delicious. 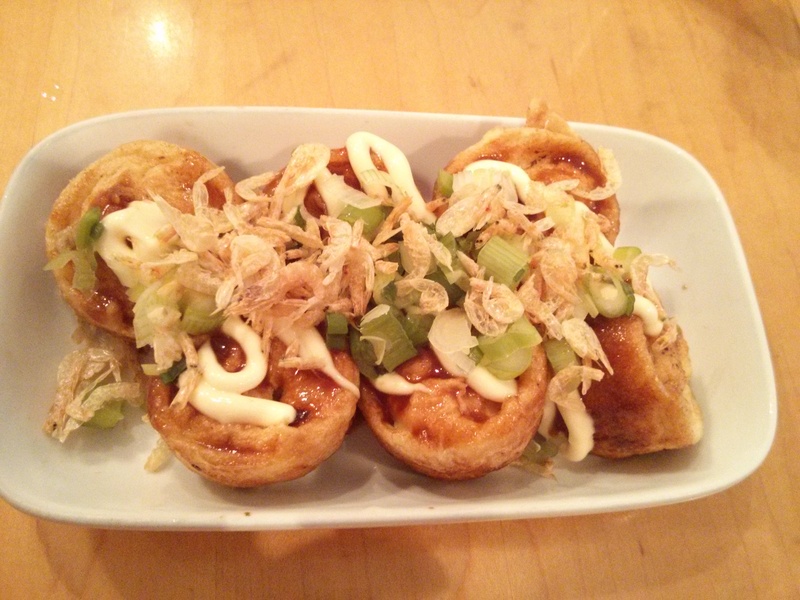 The takosen is takoyaki served between 2 senbei topped with takoyaki sauce and mayonnaise. Takoyaki is octopus covered in flour in a ball-shape and grilled. Senbei is a type of Japanese rice cracker. 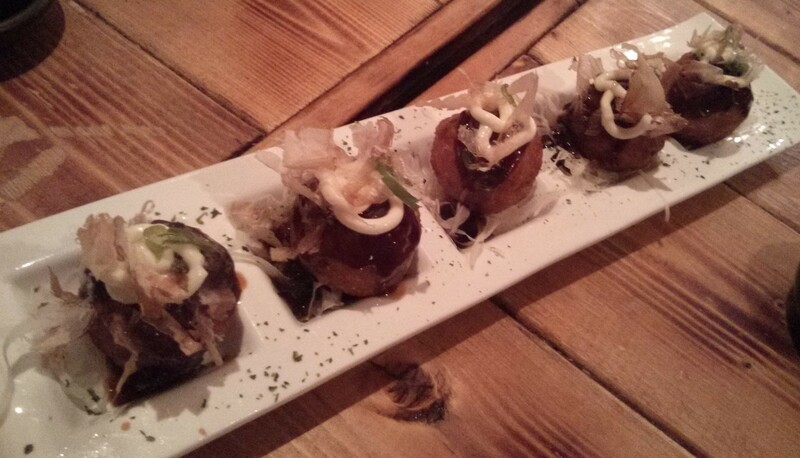 The takosen is an interesting take on the takoyaki. The tsubugaiyaki was scrumptious. 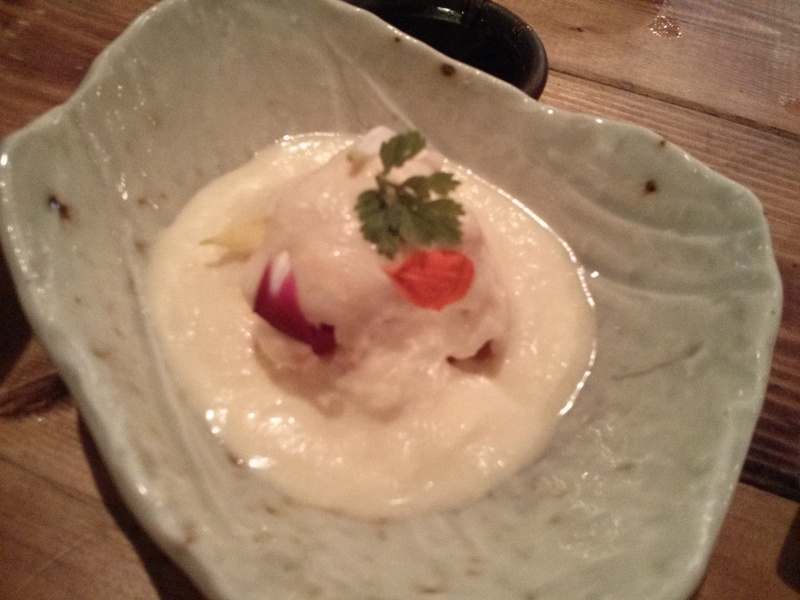 The tsubugaiyaki is tsubugai clam dough balls with mayonnaise dressing and shrimp. 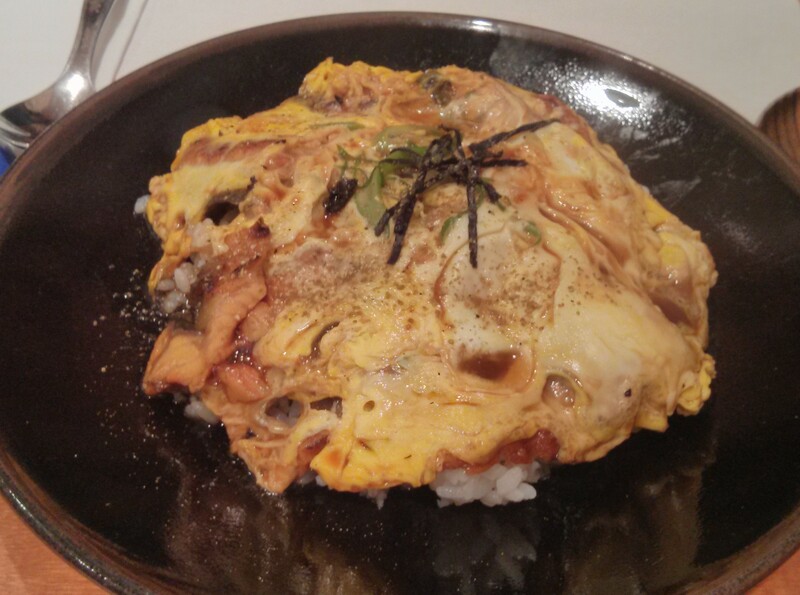 I preferred the tsubugaiyaki over the takosen. 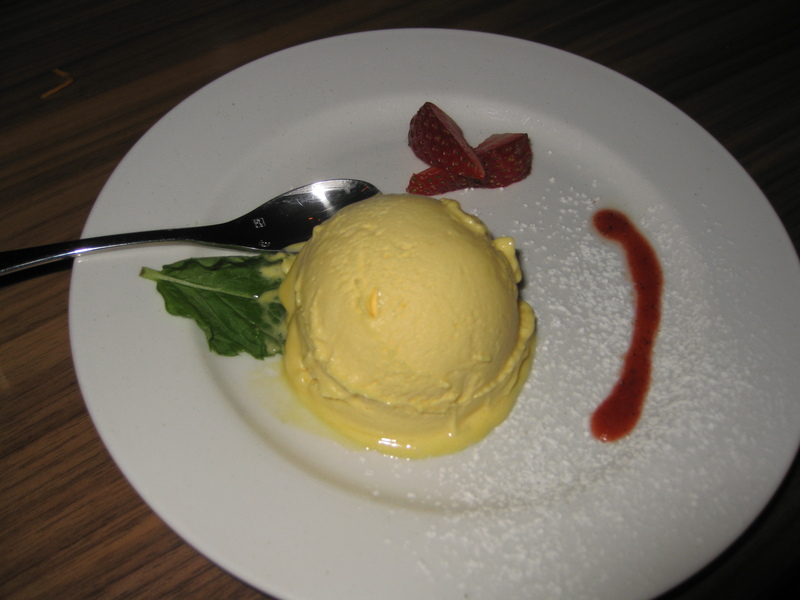 My friend also recommended the pudding for dessert however it was already sold out when we tried to order it. This is the easiest dish to sell-out so it’s best to go there really early if you want to eat the pudding. 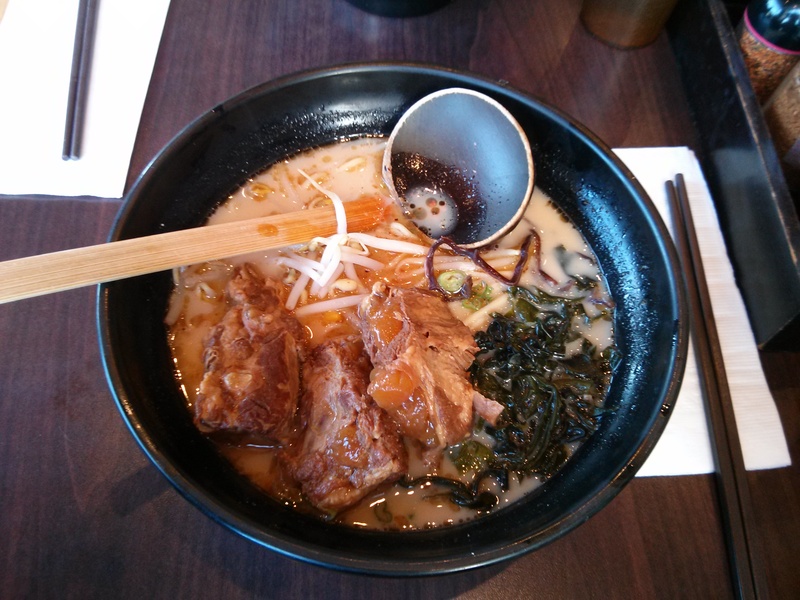 Overall, it’s an inexpensive Japanese restaurant in downtown Toronto if you’re looking for Japanese food that’s not sushi and sashimi.